Whenever we discuss creating a University brand, I end up thinking about seminal ‘gross out’ campus comedy movie, Animal House. I’m not contemplating launching an image of Edge Hill as the home of out-of-control Kennedy-era hedonism, with demented frat parties etc. (New slogan: ‘Toga! Toga! Toga!’) It’s some of the movie’s subtler moments that I’m reminded of. 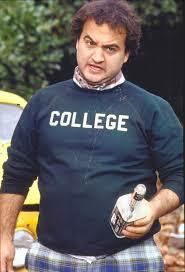 This is when the Animal House flashbacks kick in. The film opens with a pan across an American campus, accompanied by stately music – creaating a ‘this is important’ mood. The camera focuses on a typical founder’s statue, a bewigged worthy, I think holding a book. On the plinth is the university motto: KNOWLEDGE IS GOOD. This still cracks me up – the redundancy, the idea that someone thought this worth saying, mediocrity being writ large. My worry then is that a kind of ‘pure’ university branding wouldn’t be doing much more than than this. Each university needs to be more than a place where knowledge comes from (offered in a particular location) But if we want to say more than ‘knowledge is good (get some here)’ what kind of extra ingredientsts can be added into the mix? Excessive focus on vocationality, access, elite research, business links, student experience, or campus can all somehow undersell the richness of a unversity identity.